These crispy pan fried vegetable dumplings are called 'pot stickers' because they tend to stick to the bottom of the pot whist being fried and steamed. Let me explain how: a little oil coats the bottom of a deep pan (with a fitted lid). When it is hot, the dumplings are added to the pan. The pot is then covered for a few minutes for the dumplings to fry. After a few minutes have passed, water is added to the pan, it is then covered again and steamed for a couple of minutes. Finally the lid is removed to allow the water to evaporate. 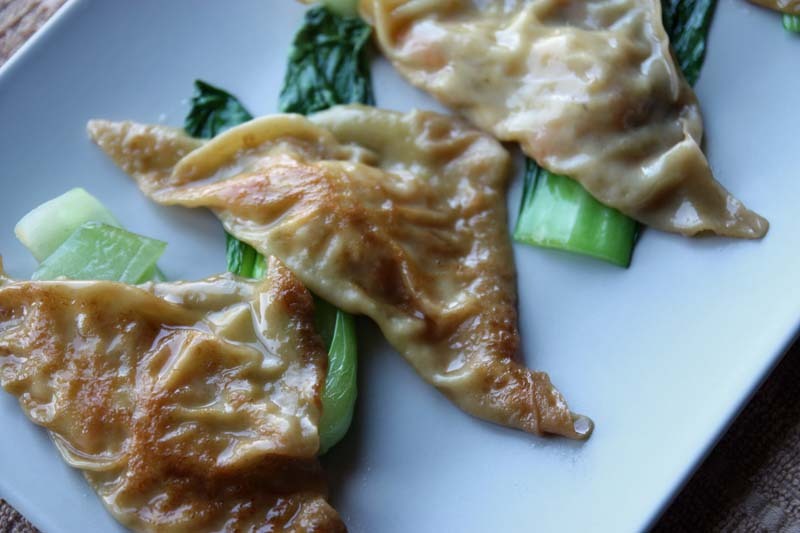 Pot stickers feature heavily in my American and Canadian vegetarian and vegan cookbooks. As someone who is not big into the flavours of the Orient and Chinese cuisine, I have always liked the idea of crisp dumplings (a bit like Spring Rolls) and have always wanted to make them, but for one reason and another, just never got round. Then a few weeks ago I caught a glimpse of Celebrity Chef Ken Hom on a weekend cookery show making Pork Pot sticker dumplings. He made it look quite straight forward and at that moment I decided I wanted to make a veggie version. 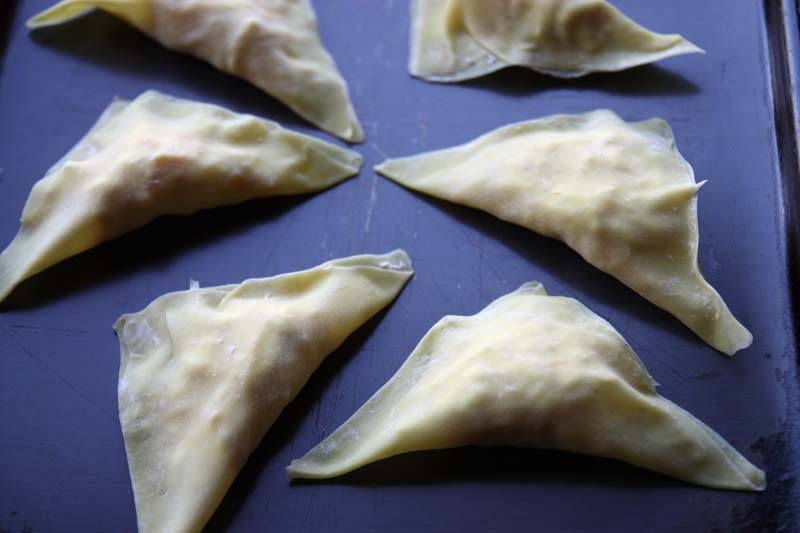 You can choose any vegetable filling for your wontons, but mine are made from the remnants of sliced white cabbage and carrots left over from the Sri Lankan Carrot Curry recipe. As this was my first time making pot stickers, I did have a few issues. First because I skipped on using the food processor, I noted that my minced cabbage was not minced enough, proving a little chunky for the wrapper. Secondly, I misread the instructions fried the wontons in too much peanut oil, then drenched them in too much water. This resulted in a soft wonton, rather than a crisp one. Regardless of the instructions being poorly followed, the result was tasty though a little greasy. As there was just D and myself to enjoy them, I constructed only 12 wontons yesterday, good job as this allowed me to learn from my mistakes. Today's Vegetable Pot stickers were much crispier and less greasy. It was a vast improvement. Served on a bed of stir fried bok choy and a small bowl of plain soy sauce for dipping. In a food processor, combine the cabbage, tofu, carrots, garlic, ginger, sesame oil, cornflour and salt and pepper. Process for a few seconds until well combined. I have to admit I skipped this step and just mashed them in a bowl, but noted my cabbage shreds were a little large and were bit of a nuisance when filling the wonton wrappers. 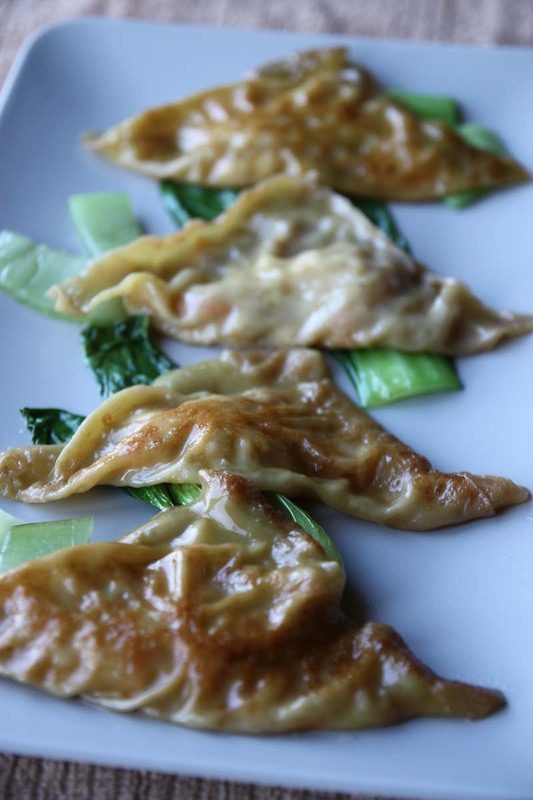 Place 1 wonton on a work surface and spoon 1 tablespoon of the filling mixture in the middle. 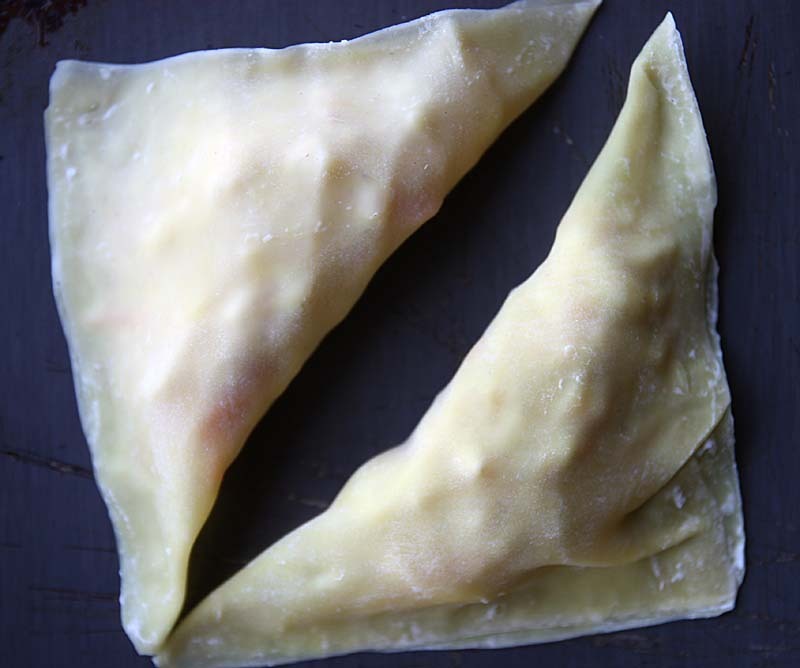 Fold the wrapper over the filling to form a triangle. Moisten the edges of the wrapper with water to seal. Repeat with the remaining wrappers and filling. *The shop bought wonton wrappers I used contain egg, but seeing that this recipe came from a vegan cookbook, there must surely be a vegan version. So please read the packet if catering for vegans. I have eaten pot stickers and they are absolutely addictive! Thanks for sharing your *mistakes* so we can learn from them, too. What a great way to use up leftovers! That look really good. Thanks for stopping by! I have heard of these before, but never tried them. I would never have imagined how to cook them. Another fantastic recipe that looks divine and not too tricky to make. Thank you My Backyard Farmyard. 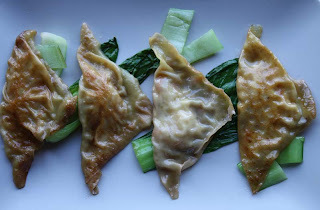 I've decided that I like pot stickers and will sure be making them again! I'm pleased that you were happy to read of my *mistakes* too, I do think we all learn from them! Thank you so much Daffodil. Yum! I keep meaning to try my hand at homemade pot stickers. This looks like a keeper! I see me making many more of these in the future, but with different fillings. I'd be tempted to fry both side too. I agree the result is delicious. I have yet to try them 'just steamed'.